A couple of years ago my husband and I had the opportunity to spend 2 years in Germany. We absolutely loved living there and really miss it a lot. Actually, the only time I don’t miss Germany is in the summer. Those summers in Stuttgart with no air conditioning were pretty brutal; however, the heat usually only lasted a couple of months, and it was followed by blue skies and cool breezes. It was time to start planning the yearly trip to Munich for Oktoberfest. But more important, it was time for Kürbissuppe, or pumpkin soup. It seemed like every restaurant in Germany had seasonal dishes that you found everywhere. Oh, how I miss those big fat white asparagus during Spargelzeit in Spring. You always knew it was fall in Germany when the apples and walnuts appeared on the trees, and pumpkin soup appeared on the menu. 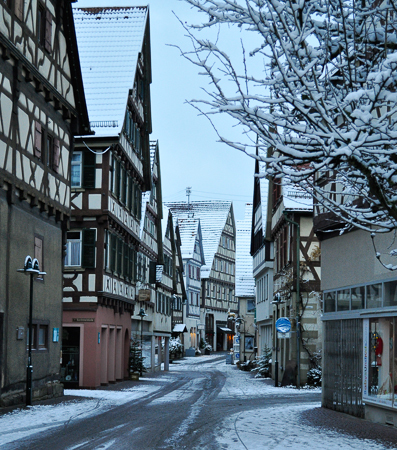 I lived in a beautiful town just South of Stuttgart, called Herrenberg. It wasn’t large, or small. In the words of one famous fictitious little girl; “it was just right.” We lived close enough to walk downtown to the farmers’ market, the train station, and a few really good restaurants. I first had pumpkin soup at the Hotel Hasen Restaurant. They always did something really original with standard German cuisine, and this soup was one of those dishes. If you ever have the opportunity to travel to Stuttgart, Germany, I highly recommend taking a side trip to Herrenberg. 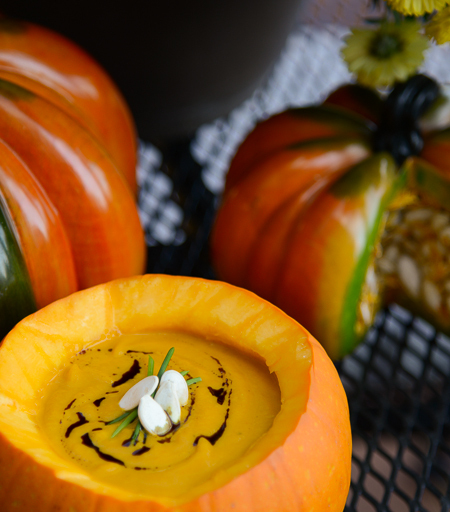 In the meantime, let’s celebrate fall by making pumpkin soup. I’ve played around with this recipe for awhile. I’ve made it with both fresh and canned pumpkin. These days I’m leaning more towards keeping things fairly simple, so I made it with canned pumpkin. Make sure you use straight pumpkin, not pumpkin pie filling. You could also use butternut or other winter squash. 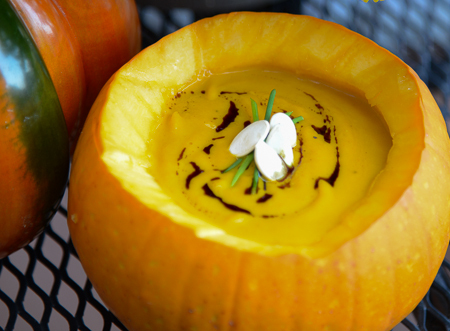 I garnished the soup with a swirl of pumpkin seed oil, some chives, and a few toasted pumpkin seeds. You can use any of those, some, or none. A dollop of crème fraiche would also be nice. 1. Sauté the onion and leek in the coconut oil until limp. 2. Add the garlic and ginger and continue cooking 1 more minute. 3. Add remaining ingredients. Bring to a boil, lower heat and simmer until potato is cooked through, about 20 minutes. 4. Puree the soup in batches in a blender. Taste soup and season with additional salt and pepper if necessary.